I mentioned last week that I've been missing Maine and missing getting a green olive cream cheese bagel from a local bagel shop. I realize that only about a 1/3 of my readers will stick with me on this post - green olives are certainly an acquired taste. I'm the only one in my family that likes them. Everyone else pretends to die at the idea of me eating them. Whatever! So, if you like green olives, or know someone who does, keep reading. Other wise, it's okay, I'll catch up with you later. So, Maine! I love Maine! I called that state my home for 10 years and even though I knew in my heart that it was time to move to Colorado, it was hard to leave. My favorite little town, and the last placed we lived in Maine, is called Camden. It was there that I fell hard for green olive cream cheese bagels. So, why did a Utah girl end up in Maine? Well, in 1997 my husband and I stood on the corner of Elm Street, in Camden, by the city green. I was holding my then 3 month old daughter and we both had a rush of emotion hit us. We were just on vacation but there was a sense of clarity in that moment and we knew we were supposed to live in that town. It was home! 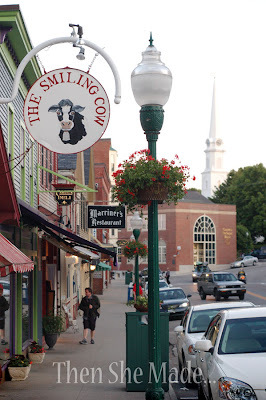 I'm pretty sure our family thought we were just drawn to Maine because of it's New England charm and one brother claimed it was the farthest away we could get from family, but, I've had those impressions before and I knew - I knew - it was something more. It took us another visit a year later and then another two years to pull things together but we did it. We moved. Our family didn't understand. My parents thought we were insane. Moving 3,000 miles away from family and friends "just because" was unthinkable to them. But we knew it was right. And, years later, even my dad admitted it was a good move for us. We didn't end up in Camden until 2006. We'd visit every chance we got but moving there didn't happen right away. When it did though, it was right and we were lucky enough to have this be our regular view on evening walks. Beautiful! They'd shoot fireworks out over the harbor in the summer and I swear, it was the most patriotic thing you could ever see. I felt very American living in small town USA. Here's a little map of Camden. We lived at "A". The Bagel Cafe was at "B". It was so close. 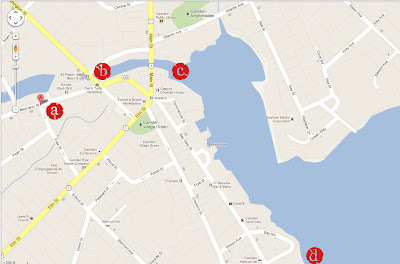 The Village and harbor are at "C". I felt so spoiled that I lived in a Norman Rockwell like town were I could walk everywhere. 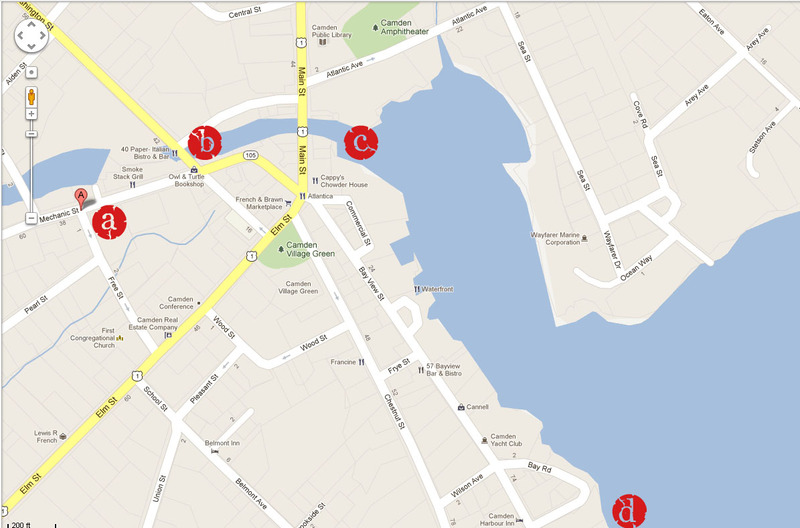 It would take about 5 minutes to walk to the harbor, village shops, and the library. If you ever get to go to Maine, go visit Camden. It's a busy tourist town in the summer but the beauties are worth the trip. Oh, and see "D" - I miss that place the most. Laite Beach. It's not a beautiful beach as in sandy and warm. It's slightly rocky, and not very big, but it was my place. Very few tourist knew about it so it was a place to go and sit and think and most of all search for sea glass. I miss searching for sea glass. I miss Laite Beach. I miss my walks to the village. I miss the friends I left behind. Ok, I'm starting to miss Maine even more.... let's move on. 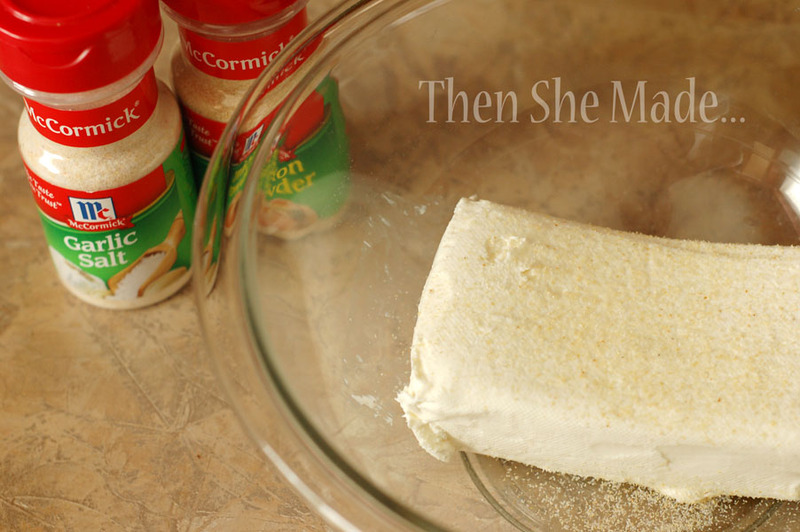 Step 1: Start by letting your cream cheese soften. You want it soft enough that you can stir it easily. Then, sprinkle on some Garlic Salt and some Onion Powder. I didn't measure, I just sprinkled. Start with less and then add more to taste as needed. 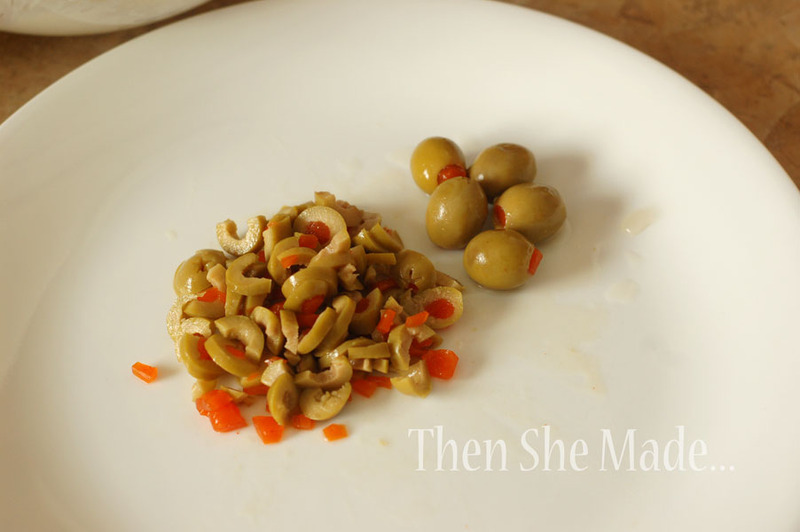 Step 2: Next, take a handful of green olives and chop them up. You'll want about a 1/2 of a cup, more or less. I tend to go for more but 1/2 cup is a good amount. Step 3: Stir everything together. Taste it and if it needs more garlic or onion, mix in a little more. Step 4: That's pretty much it. I like to let the spread sit in the fridge for a little bit, maybe an hour before I eat it. The flavors tend to settle this way. 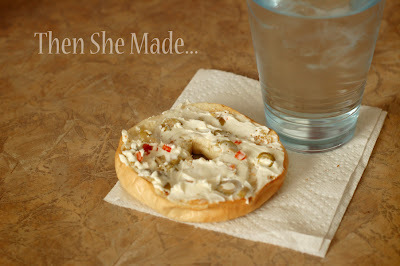 Then, when you are ready for a quick snack, toast a half of a bagel, spread on the yummy goodness and enjoy! You can also put it on Ritz crackers for an appetizer too. So, thanks for letting me reminisce and if you try the recipe, let me know what you think. This looks FANTASTIC! Green olive hummus is my all time favorite snack (with some pita chips and a beer) and this looks like a close second. Your Maine friends miss you too! I was in Camden just a few weeks ago put picked sea glass on the beach in Searsport just cause it was easier to get to. Love green olive cream cheese but may I suggest that you try using garlic powder instead of garlic salt since olives can sometimes be salty on their own. Either way, enjoy! Can't say I like the olives but I love Maine. I love green olives. I make this appetizer where you cover them in a flour and cheese crust and bake them. SO good! 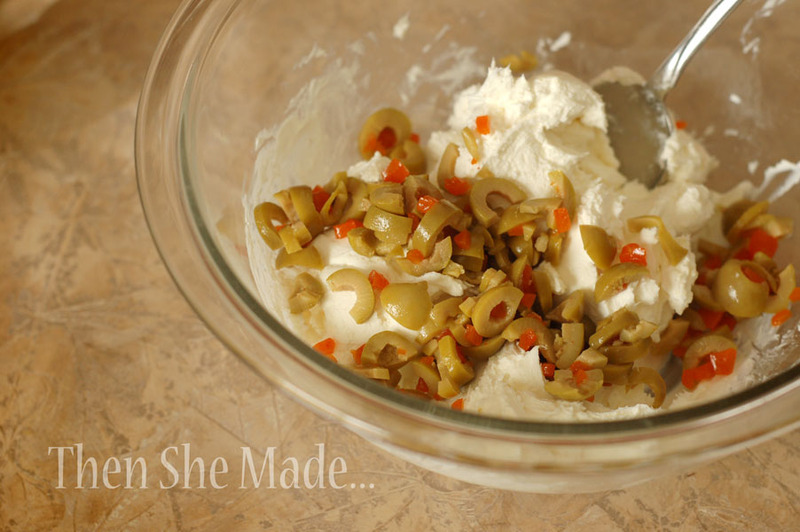 The green olive cream cheese sounds divine! I love your story about Maine. I've never been there but it looks quite beautiful. Ohhhhh, this makes me so sad! Laite Beach is my favorite, too. Laite Beach and the Children's Chapel. Camden is a special place for sure. I wanna go! It is on my bucket list. Why did you leave? I think once I finally got there, wild horses couldn't drag me away. Also interested in the recipe "bluefunk" is talking about...care to share?! Camden is gorgeous. 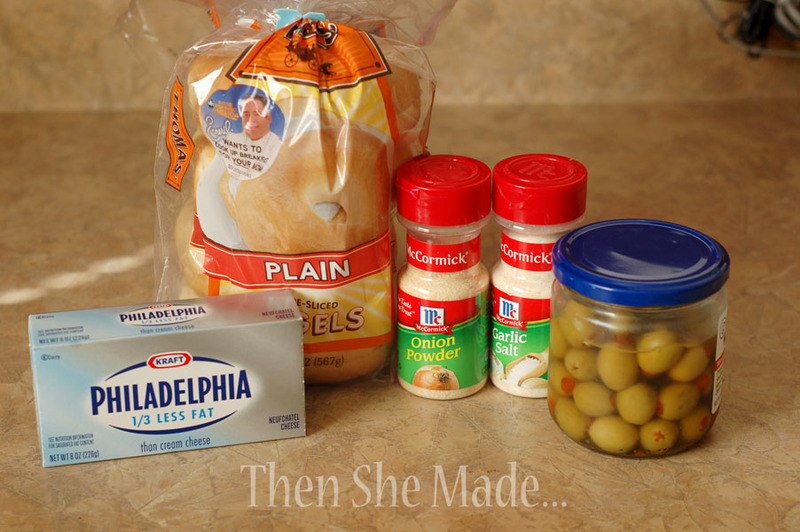 I've never heard of garlic powder with the cream cheese and olives. I may try it for my guys sometime. Thank you for the delicious recipe! I made this for lunch yesterday and it was SO good! 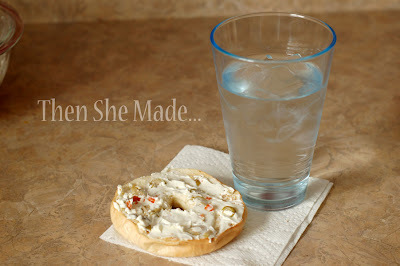 I seriously eat green olives on EVERYTHING and I can't believe I've never thought of adding them to cream cheese! Thanks so much for the inspiration. I can't wait to try this tomorrow morning! My mom made green olives and cream cheese for us all the time growing up, but we ate it on wheat thins. I have never tried it on a bagel, that's next on my list. OMG! I am ready to pack my house and hit the road! Camden is movie-perfect, AND they have olive bagels. Sign me up! I grew up with this being made and stuffed in celery sticks. We usually only made it for holidays, but it is delishous. I have a newfound like for green olives. This totally hits the spot. Enjoying it with some saltines for a light lunch. Thanks for the recipe and the story! After reading this, as I am going thru a divorce, this makes me want to take my kids and move to Maine, or least visit! I have just got done looking Camden up and it looks beautiful!